How often does spending big in free agency actually result in winning more games the next year? Thank you for asking this question, voice in my head, because I was wondering the same thing. 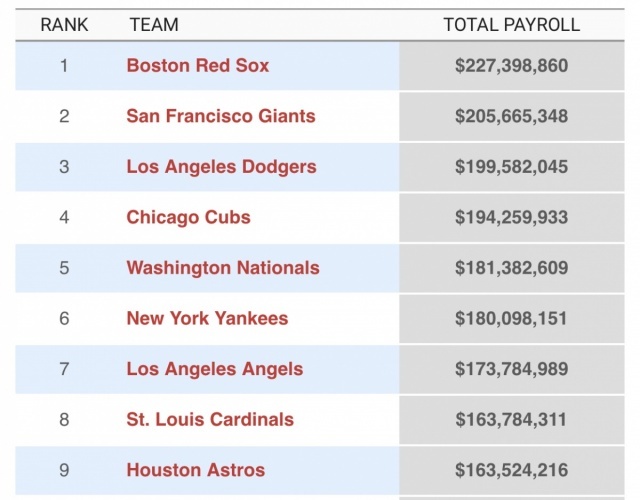 What I want to look at are the teams that spent the most money in the offseason and then how they did the year following with their new toys.Given that we’re Twins fans here, payroll has never been a topic of discussion. No one has ever been annoyed at the lack of big spending in free agency and is always perfectly OK with how the front office allocates their resources, especially this year. Free agency is supposed to be an opportunity to right the sinking ship through veteran additions to a low-talent roster (Texas), to fortify a good roster to take their team over the top (Boston), or to sit around and talk about how good the farm system is (San Diego). Edited by Major League Ready, 05 February 2019 - 11:09 AM.